Qualified high school students are eligible to participate in college courses and in some cases can receive dual credit. Connections allotment can help fund these classes. Juniors and Seniors may also be able to take advantage of substantial discounts through the Jump Start program. See your advisor for questions regarding eligibility for college courses, deadlines, etc. College Textbooks must be returned to Connections if paid for out of the students allotment. Take Accuplacer at KPC. Contact your local campus to sign up. Seats fill up early! *ACT/SAT scores can also be used in lieu of Accuplacer scores if they are less than a year old. Bring scores to your Connections advisor who will recommend classes for which you are academically prepared, and help you determine what classes will be accepted by KPBSD towards your high school graduation requirements. 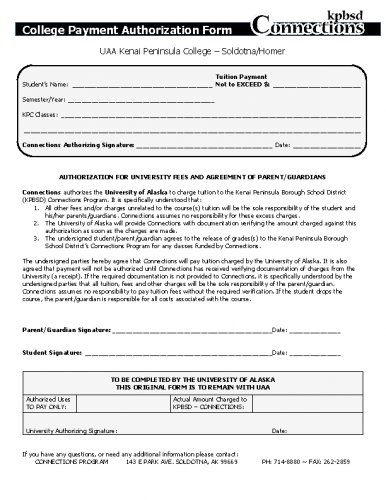 Get the “High School Student Waiver” signed by your advisor and you parent. Complete the “What you need” steps on the waiver form. Attend “Advising & Signature” session and “Registration” session or make an appointment with a KPC counselor.